Nicole by OPI recently added 15 new polish shades to it's permanent line-up and I have all of them for you. I'm going to divide them into posts by color groupings. I do all of my swatches outside and it is currently WAY to cold to swatch 15 polishes in one day here in Connecticut, haha! Today's post is all about the blues and greens (my favorites!). 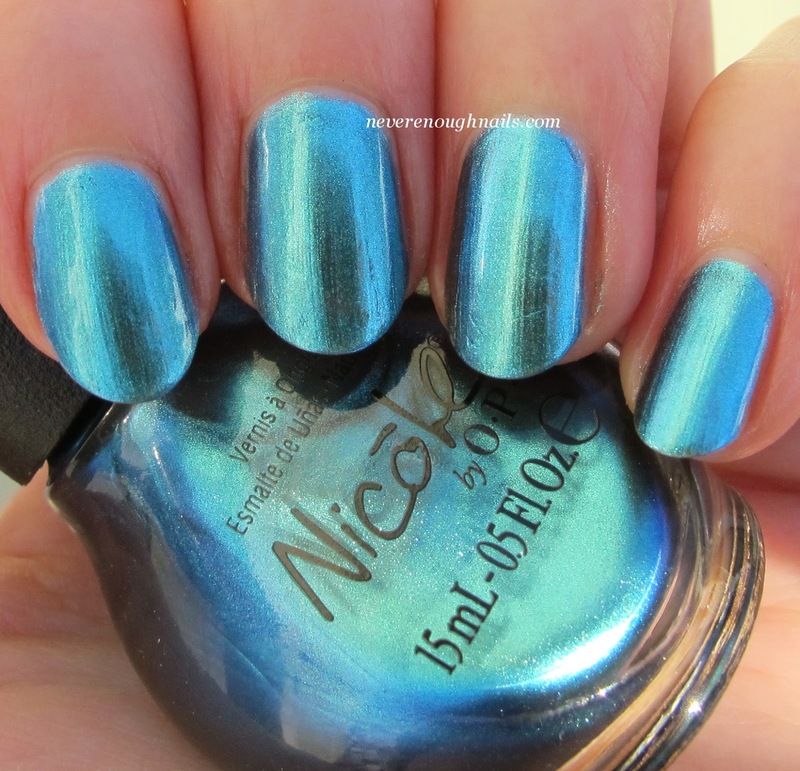 Nicole by OPI Emerald Empowered is a beautiful blue to green duochrome. 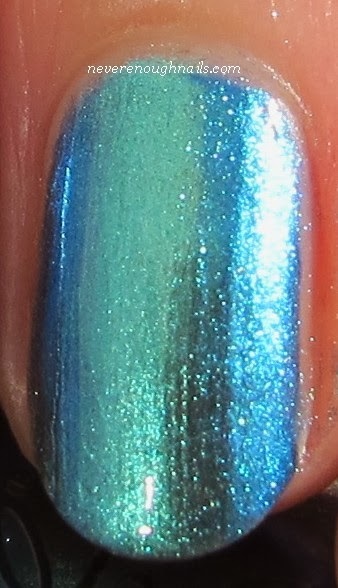 The duochrome effect is pretty strong, sometimes this polish looks all blue (like the first picture), other times it looks much more green, like the picture below. This is three thin coats of Emerald Empowered. It was opaque in two, but I did the third to cover up some imperfections in my nails that were still visible with two coats. The formula was excellent, so easy to use and perfect consistency. I think I have other polishes similar to this, but I think the duochrome effect is a bit stronger than some near dupes I own, so it's staying in my collection. Nicole by OPI I Shop Mintage is a really cool pale mint crelly. It is a real mint color in my opinion, not too blue leaning. I love that they went with the crelly finish, it really stands out in a sea of mint cremes and shimmers. I would imagine this maybe is similar (not the same) to RBL Fire Queen, although I don't own that one. This is my new go to mint. The crelly finish means that I Shop Mintage needs three coats and still had a bit of VNL in certain lights. The first coat I did was thin and I could see that it was pretty sheer, so my second two coats were thicker. I ended up with a bit of streakiness on my ring finger, but careful application seemed to prevent that elsewhere. The formula needs a little care, but it's not terrible and I think it is worth it. OK well this is a big camera fail right here. Nicole by OPI Teal Me Something New is not a bright robin's egg blue like my pictures might suggest. It is actually a teal creme, though it does lean on the blue side of teal. I tried taking pictures of this indoors and in the shade and the same thing happened. What I can tell you is that the polish is pretty true to bottle color, so if you see this one in person and like it in the bottle, you will like it on the nail. This is two coats of Teal Me Something New. Great formula, no problems here! 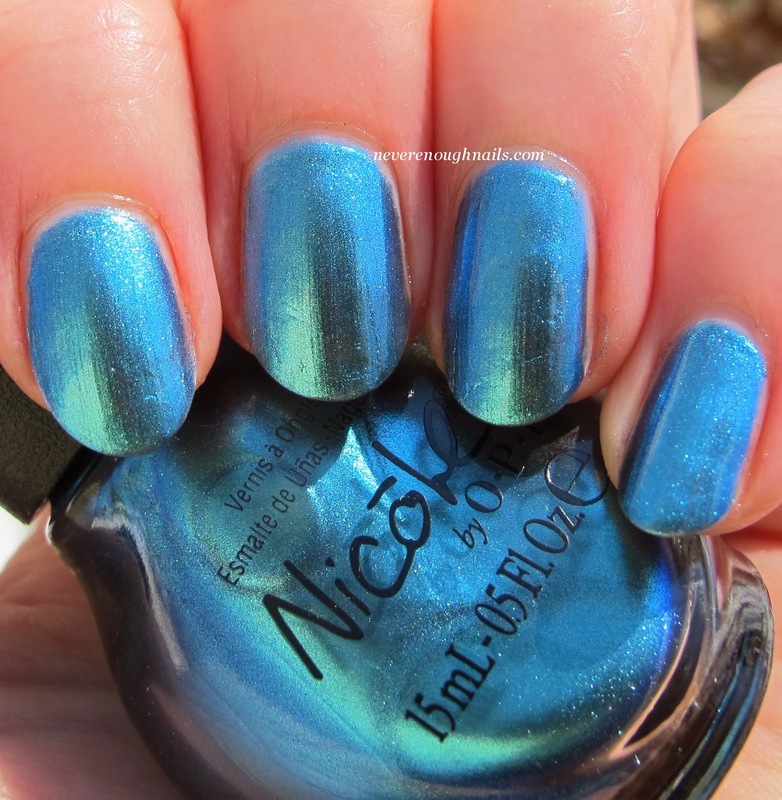 I am such a fan of deep blue cremes and Nicole by OPI This Blue Is So You! is really just so me. It's a nice dark blue, but it never looks black. It has a smoky quality to it that is really nice. This reminded me of the Prussian blue Crayola crayon I used to love (although not as much as I loved cerulean!). As it turns out, I googled Prussian blue and it really is a match! This is two coats of This Blue Is So You! and the formula was great here too. Nice and smooth. Overall I love all four of these, especially I Shop Mintage. I think these are a great addition to the Nicole by OPI line-up! The 15 new nail lacquers are available now for $7.99 each at retailers including select Walmart, Target, CVS, Kmart, Kroger, ULTA, H-E-B, Meijer and Duane Reade locations. In Canada, these shades will be available for $10.99 each at Shoppers Drug Mart, Walmart Canada, Jean Coutu, Loblaw, and London Drug.